Good Tuesday morning. Bulletin: "Second ex-staffer accuses Conyers of sexual harassment," per Detroit News. It's #GivingTuesday. If you're in New York ... I'll be discussing the future of philanthropy from 6 to 7 p.m. (doors open at 5:30) at Convene, 730 Third Ave., 17th floor (near Grand Central). My guests will include Henry Timms, executive director of the 92nd Street Y, and founder of #Giving Tuesday; Janet Scardino, CEO of Comic Relief Inc.; and more. RSVP here. Ivanka Trump is speaking now at a Global Entrepreneurship Summit, co-hosted by the U.S. and India in Hyderabad: "We are committed to supporting women, and men, who work, inside and outside of the home." 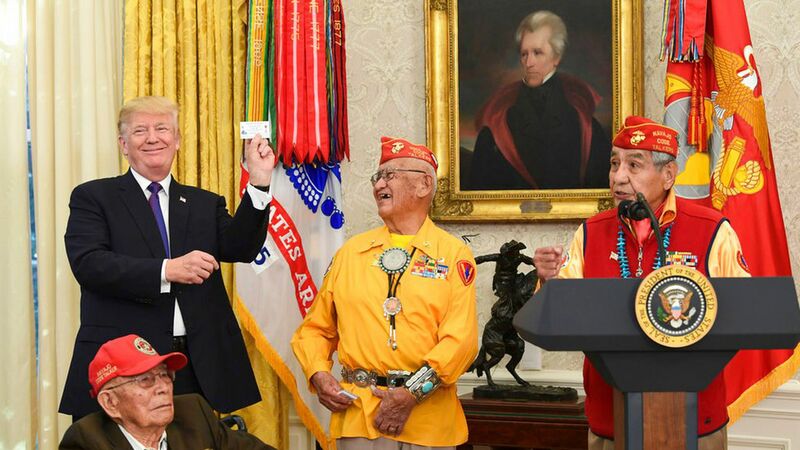 1 surreal thing: a twisted "Trump Show"
President Trump refers to Sen. Elizabeth Warren as "Pocahontas" at a celebration of Native American war heroes. Read this one twice, folks. She goes on MSNBC (twice) to call it a "racial slur," and say he can't "shut me up." The President of the United States proposes a Fake News pageant: "We should have a contest as to which of the Networks, plus CNN and not including Fox, is the most dishonest, corrupt and/or distorted in its political coverage of your favorite president (me). They are all bad. Winner to receive the FAKE NEWS TROPHY!" The legal and political fight continues into the wee hours. At 12:10 a.m., the Justice Department emailed us: "Filing in CFPB case." After Trump attacked CNN International, Wolf Blitzer vows: "[W]e will never bend or break." Sound smart: What a dumb waste of another day. I'm sure Day 313 will be better. An unusual perk for members of Congress: taxpayer-paid settlements in sexual-harassment cases. Friendlier skies: The ability to reserve seats on multiple flights but only pay for the flight boarded. Life access to taxpayer-funded gym at the Capitol, House and Senate floors, parking in House lots, and House and Senate dining rooms. Depending on age and length of service, a lifelong pension of as much as 80%. Exemption from D.C. restrictions on smoking in workplaces. Federal subsidy for Affordable Care Act premiums. A death benefit for survivors that's higher than for military personnel killed in action. With administration and leadership aides frantically negotiating with holdout senators, the Senate's tax vote scheduled for late this week could lapse into next week. That would raise everyone's blood pressure: Everything is fragile. A senior administration official told me: "We're still getting it done in a matter of a couple months, instead of a couple of years. It's OK if it takes a few extra days." The bill is in the ugly sausage-making phase, with senators taking advantage of their leverage to make demands. At least six GOP senators are holding out (John McCain and Jeff Flake of Arizona, Bob Corker of Tennessee, Susan Collins of Maine, Ron Johnson of Wisconsin and Steve Daines of Montana). Lose three of those, and the bill is dead. McCain says he's undecided. His concerns? "A lot of things." Will be drama to the end: The well-wired Chris Krueger of Cowen has "~8 Republican Senators on fence/lean-no ... Any slippage, and momentum goes other direction with Alabama Senate election [Dec. 12], and shutdown negotiations next week." "High concern" about Corker of Tennessee and Johnson of Wisconsin: They're simply not on board yet, and they both have a vote in the Budget Committee — a vital procedural step scheduled for 2:30 p.m. today. If Johnson votes against this, there's no hiding! Everyone will pile up on him. And there's no telling what Trump will do. A problem for McConnell & Co: Johnson and Corker sit on opposite ends of a Catch 22 seesaw: Johnson wants lots more money for "pass-through" businesses. But every extra dollar you give him is another dollar that will blow out the deficit and worry deficit hawks like Corker, Flake and McCain. A senior GOP aide: "It's unclear what exactly that Senator Johnson wants. ... It's potentially hundreds of billions of dollars." Be smart: House leaders are insisting on a conference committee to work out the vast differences between the two chambers' tax bills: They say they don't have the votes for the Senate bill, and won't swallow it whole. That's a whole new minefield. How It's Playing ... N.Y. Times lead story: "TAX WRANGLING AIMS TO SWEETEN GAINS OF WEALTHY." A female rider and the horse fell into the ravine at about 4:30 p.m. Sunday in rural Apple Valley, Calif., in San Bernardino County. The woman, uninjured, walked about 1½ miles to cellphone reception. The horse was injured to the point that it wasn't able to walk out of the ravine. But sunset was approaching. Officials returned to the scene at roughly 6:30 a.m. With assistance from a vet to prep the horse, officials lifted the horse to safety in a special harness in early afternoon. The horse, with scrapes and bruises, was back at a ranch stable in the care of a vet. The rider was present during the rescue. "During the interviews, she repeatedly pressed Post reporters to give their opinions on the effects that her claims could have on Moore's candidacy." "The Post did not publish an article based on her unsubstantiated account. When Post reporters confronted her with inconsistencies in her story and an Internet posting that raised doubts about her motivations, she insisted that she was not working with any organization that targets journalists." Why it matters: "[O]n Monday morning, Post reporters saw her walking into the New York offices of Project Veritas, an organization that targets the mainstream news media and left-leaning groups. The organization sets up undercover 'stings' ... meant to expose what the group says is media bias." O'Keefe's hidden-camera targets have included CNN, the N.Y. Times, the DNC, Planned Parenthood and more. Why it matters: As ESPN invests in digital to make up for linear TV declines, its Fantasy platform is proving to be a critical driver in creating a direct-to-consumer relationship that the network needs to move consumers over to streaming. It could also help bolster new revenue streams for ESPN and Disney — particularly in e-commerce and subscriptions. The success of ESPN Fantasy has the attention of ABC executives. Last year, Disney launched a fantasy league game for ABC's "Bachelorette" to help broaden the fantasy reach to women. The two Bachelorette Fantasy League games were played by more than 700,000 users, 75% of whom were women. Dennis Crawford, senior marketing manager: "Every time we've done consumer research on why some people do not purchase the product, the No. 1 thing that comes back to us is there's something in the coffee." Turns out, it's "100 percent premium coffee." The brand dates to the 1920s, when the company sold ... nuts. Chaser: Chobani, which drove the Greek yogurt craze, today unveils new packaging that removes "Greek Yogurt" from the label (yogurt inside stays the same). Chief Marketing Officer Peter McGuinness says the rebrand will allow the company to go into "other areas beyond yogurt." "Jefferson Jackson was a great man." Says he'll donate his brain to science "if we still have science." Exit line: "Let's make America America again." "Tickets for the new shows will go on sale Dec. 19 for fans who have already registered with the Ticketmaster Verified Fan service, a program designed to prevent automated buyers and scalpers from hoarding tickets." "No new registrations will be allowed. Only those who have already registered but were not able to purchase tickets for the original block of shows will be eligible for tickets for the added dates." "Fans will also be able to enter a digital lottery for tickets after Dec. 19 through Lucky Seat." "The show's initial run through [Sunday] sold out in a single day, and after its first week of five performances it grossed $2.33 million. After the show was extended through Feb. 3, tickets were quickly snapped up." "The 36-year-old star of US legal drama 'Suits' has confirmed she will be giving up acting and with her new role focus even more energy on the causes that are important to her. She is already involved with humanitarian work and is a women's advocate with the UN." 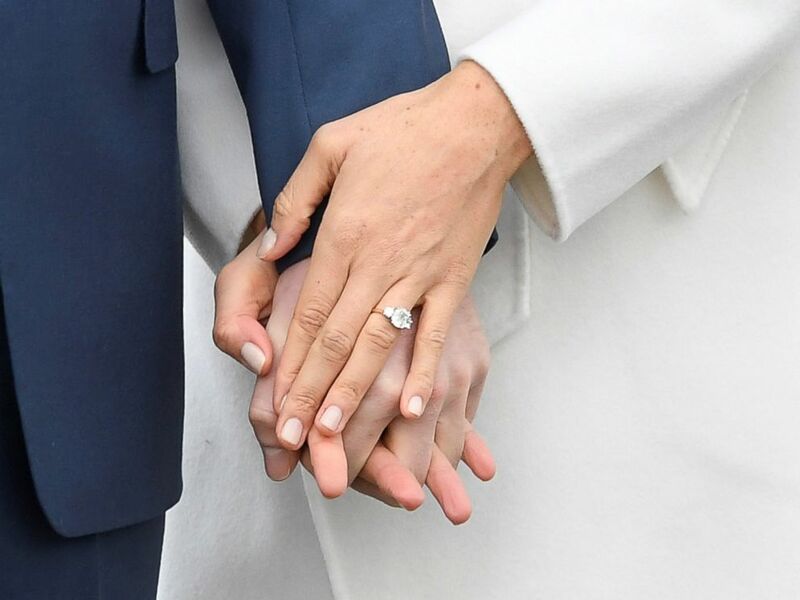 No date announced: "[T]he Archbishop of Canterbury ... indicated the couple will have a church wedding, saying the pair had 'chosen to make their vows to God.'" N.Y. Times Quote of the Day ... Meghan Markle, telling a BBC reporter how a friend set the couple up on a blind date: "The only thing I asked her was, 'Was he nice?'" "In the East Wing, visitors find a tribute to our service members and their families with the Gold Star Family Tree, which has been decorated with gold stars and patriotic ribbon. Visitors are encouraged to write a message [on digital tablets] to their loved ones who are on duty or abroad." The China Room "is set up for a family Christmas dinner, with the table displaying the china from President Ronald Reagan. Then, visitors will see the Library, which features President Franklin D. Roosevelt's 1866 edition of 'A Christmas Carol.'" "On the State Floor of the White House, the Grand Foyer and Cross Hall celebrate the first themed White House Christmas, which was the 'Nutcracker Suite' in 1961." First Lady Melania Trump: "As with many families across the country, holiday traditions are very important to us. I hope when visiting the People's House this year, visitors will get a sense of being home for the holidays."